What size glove does my child need? Does the type of material make a difference? Here we’ve put together the most comprehensive article on the internet for helping you choose the best youth baseball glove for your recreational or little league player. In addition to offering you our expert-selected picks for the top five youth gloves on the market, we’ll also go over all of the crucial information you’ll need to make a smart, informed decision while purchasing the ideal glove for your child. In case you don’t have the time to read through our entire buyers’ guide, we wanted to begin by listing our top five picks for the best youth baseball glove of 2018. These five choices include gloves that fit into all budget and performance needs, and any of them would make great choices for just about all amateur youth players. 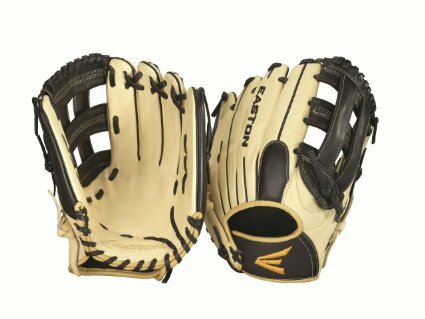 Our #1 pick for the top youth baseball glove of 2018, the Easton NATY1200 brings all of the comfort and quality of a high-end adult glove down to a more compact children’s size. The 12” size of the NATY1200 makes it ideal for older little league players, as well as those in outfield and first base positions. That’s because the glove’s larger dimensions make it easier for younger players to catch and hold onto the ball. For maximum speed and flexibility, the pocket on this youth glove is designed in an “H” web open back pattern. It also comes equipped with a helpful VRS palm pad that softens the impact from baseballs which are caught in the palm of the glove. One of the best features of the Easton NATY1200 is that it’s super easy to break-in. After just a little bit of use, and a little steaming or conditioning, your child will have a high-quality, comfortable and flexible baseball glove that’s ready for game day. For that reason, this Easton mitt is our number one pick for the best youth baseball glove of 2018. If you’re looking to buy a super comfortable, well-crafted glove that will be already broken-in and ready for your child’s use, the Mizuno GPP1150Y1 definitely deserves a closer look. Crafted from professional quality treated leather, the GPP1150Y1 is one of the most comfortable ready-to-go youth baseball gloves out there. Your little league player could put it on as soon as it comes in the mail, and be ready for practice or the big game the next day. 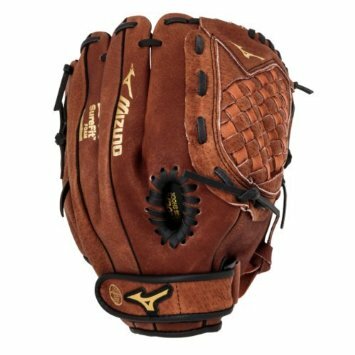 At 11.5”, this Mizuno youth glove is perfect for nearly every position except for catcher, and it’s large closed-mesh pocket makes catching fly balls, grounders, and throws much easier than models with smaller dimensions. One inherent disadvantage of the Mizuno GPP1150Y1 is the fact that it’s soft, flexible shell doesn’t provide the same level of cushioning as other more rigid youth gloves. This can be a negative for outfielders who are constantly fielding fly balls. Conversely, the fact that the glove is so flexible, aided by its patented PowerClose design, works wonders for improving the handling and ball control of infielders. The Wilson A360 Baseball Glove is one of the most diverse, multi-functional gloves out there. This youth baseball glove comes in a range of different sizes starting with size 10 and running all of the way up to size 12.5, and its custom craftsmanship makes it a good choice for any base or fielding position. Unlike the other gloves we’ve talked about so far, however, the A360 is not made entirely out of leather – it’s half-leather and half-synthetic. While this means it may not provide the same level of long-lasting construction and comfort as some of the other models, it is priced accordingly. The Wilson A360 Baseball Glove is a solid choice for anyone searching for a backyard glove, or an all-purpose glove for the first-time or young amateur player. 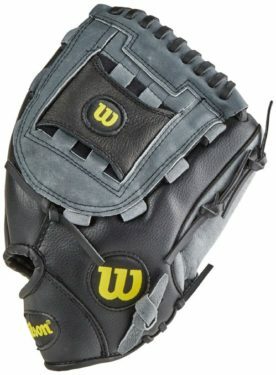 It’s also a good pick for anyone specifically looking for for kids baseball gloves that fit in a tight budget. A great choice as a low-end practice glove, the Easton ZFX 1051 utilizes an ultra-soft leather to provide mid-grade comfort as a very reasonable price. Thanks to Easton’s Grab All Web design, this youth baseball glove’s pocket is 40% larger than you’d traditionally find in a youth glove. This equates into your player having a much easier time learning to catch and hold onto balls. One unique feature of the ZFX 1051 is that there are only four finger slots: one for the player’s thumb and three more for their fingers. That’s because the ring and pinky fingers are supposed to share the same slot, giving younger little leaguers more control over closing the glove and grasping the ball. Overall, the Easton ZFX 1051 is a great youth baseball glove for home play for practice, but is not the best choice for game play or older children. It will, however, work as a low-cost solution for younger little league or recreational players. One of the top youth gloves on our list for infielders, the 11” Rawlings Youth Player Preferred is equipped with both “V” web and Pro Taper patterns that are perfect for anyone whose playing middle infield positions. Because of its soft oiled leather shell and rawhide laces, the Youth Player Preferred is another kids baseball glove that’s ready to go as soon as your child gets it. With only a 10% player break-in required, this high-quality youth glove is great for the inexperienced player (or parent) who doesn’t have the time or knowledge needed to effectively break in a stiff glove on their own. Great for youth players of different ages, this Rawlings glove has a neo-flex back that’s equipped with an adjustable Velcro strap for the perfect fit on almost any hand and wrist size. 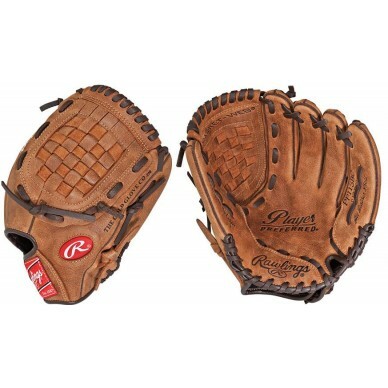 The Rawlings Youth Player Preferred is also one of the best crafted gloves on our list. While youth gloves rarely last for too many seasons because of how quickly children that age grow, this one is likely to hold its quality for as long as your baseball player – or their younger siblings – fit into it. While it may be difficult to pick a clear-cut leader out of this list, our panel of experienced glove reviewers came the consensus that the Easton NATY1200 is the best choice for anyone looking for a serious youth glove. Although it may be priced higher than many other children’s’ gloves that run in the $25-30 range, it offers a far greater level of quality and long-lasting durability at a price that is literally a fraction of what equally well-crafted adult gloves begin at. Still not sure exactly which of the youth baseball gloves is best for your young player? To provide a little bit more support, we’ve put together this comprehensive youth baseball glove buyers’ guide that’s packed full of tons of helpful information and tips. If you’ve ever shopped around for adult baseball gloves, you know they’re vastly different than youth gloves – both in price, and in design. That’s because adult gloves are typically built for extremely competitive play over a number of years. As a result, they need to be durable and heavy-duty enough to withstand wear, tear, and the elements, practice after practice and game after game. Even the highest-quality and best youth baseball gloves, on the other hand, rarely come with the same price tag you’ll find attached to adult sizes. One of the biggest reasons why is because youth gloves simply aren’t expected to be used as much – or for as long – as adult gloves. Think about it – will a glove that properly fits your child’s hands now fit just as well next season or a couple of years down the road? If they’re still growing – and most youth baseball players are – the likely answer there is “probably not”. As such, glove manufacturers design youth gloves to be affordable, yet still of a high enough quality to help the players develop and improve their fielding and ball handling skills. Fingers – Nearly all baseball gloves have slots for the player’s individual fingers. This is how the player exerts the most control over the mitt. It’s also where many youth gloves will vary from their adult counterparts – in the length of the finger slots. Some gloves however, predominantly catcher’s mitts, will have an open mitten-like area for the fingers rather than individual holes. Pocket – The pocket is the space between the player’s thumb and index finger where the baseball should be caught. Some youth baseball gloves use an aerodynamic open mesh-style weave here, while others opt for a fully-closed design for maximum stability. Regardless of which style you choose, the key component of the pocket is the fact that there’s no fingers and areas of the hand behind it, making it much easier to field balls appropriately and without pain. By and large, outfields generally prefer larger pockets than infield players as it allows them to catch long-distance fly balls with much more ease and protection. 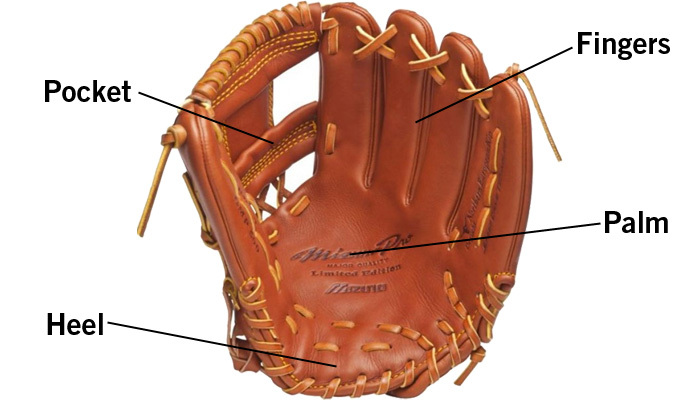 Palm – The palm of kids baseball gloves is the area of leather that covers center of the player’s hand. This part of the glove is usually flat and unpadded to allow the most control over the ball while it’s being held. In general, you won’t see very much variation in the palm area from glove to glove, but be sure to watch out for any unusual stitching which may prevent effective ball handling and control. Heel – The heel is the area at the bottom of the baseball glove where it meets the player’s hand. This area is commonly reinforced with additional padding and lacing to 1) provide extra cushioning from improperly caught balls and 2) allow for added support for the wrist area when catching high velocity hits. How Are Youth Baseball Gloves Sized? One of the most surprising things for people who are new to buying baseball gloves is the fact that they come in a wide range of different sizes. Sadly, even at the youth level, there is no one-size-fits-all option: you need to be able to know which size glove is best for your child and the position they’re playing. Most baseball gloves, except for catcher’s mitts, are measured in inches from the base of the heel to the top of the index finger – the longest distance of the glove. Catcher’s mitts, which feature a slightly different design, are measured by their circumference. For the most part, youth baseball players wear gloves ranging from size 8 to size 12. At the most basic level for the youngest players, their glove needs won’t vary by their position all of that much. That’s because the main focus will be on basic catching and handling skills at that point. But as your child gets older, having the right glove for their size and playing position will greatly improve their ability to play at a higher level with the most control. Gloves for players in the infield – second base, third base, and shortstop – are usually designed to be compact and allow the maximum amount of ball control. These players aren’t often catching long-distance fly balls that would require a large pocket, so focus should be given to mid-sized gloves which offer superior comfort and control. On the other side of the spectrum, the best youth baseball gloves for outfielders will be ones that have an extra-large pocket that is designed to catch fly balls and rolling line drives more effectively. Players on first base are the exception to the infielder rule: instead of a smaller glove made for maximum control, they typically use a larger size to easily catch balls being thrown in from the outfield of across the diamond from third base or the shortstop. Out of all of the players on the field, the pitcher, for the most part, doesn’t need to worry about catching the ball too frequently. Instead, the main focus when trying to decide between youth baseball gloves for your pitcher is to pick one that is compact and comfortable, yet offers enough room to hide the ball (and the planned pitch) before it’s thrown. While this buyers’ guide mostly covers traditional finger-socket gloves, catcher’s mitts are sized a little differently. As mentioned before, they’re measured by their circumference. For guidance, the average youth catcher’s mitt is going to be between size 29.5 and size 32. Most adult gloves – and pretty much all high-end youth gloves – are made out of leather. But that doesn’t mean that there aren’t some other options out there. In fact, youth baseball gloves can come in a variety of different base materials. On top of traditional leather, you’re likely to find gloves that are also made out of synthetic leather, treated leather, and composite mesh. Synthetic leather and composite mesh are typically only found in lower-end gloves. If you’re just looking for a cheap practice glove for the backyard, these will do. But if your child is playing competitively at the recreational or little league level, opt for kids baseball gloves crafted from real leather instead. Treated leather is an enhanced type of leather that has been conditioned for a shortened break-in time. While treated leather gloves will be more comfortable and flexible from the get-go, they will also be more expensive – although many parents and players prefer to spend a little more to avoid a long break-in time. We’ve already discussed how youth glove sizing works, but it’s worth reiterating just how important it is that you purchase a glove that fits your child properly. Too frequently, parents try to get around the fact that their little player is constantly growing by purchasing a glove that they can grow into. This this may be a good strategy for saving money on additional youth baseball gloves in the future, it will not only put your child at a disadvantage on the field now, but it can also open them up to injury from using equipment that simply doesn’t fit them. Like I said before, backyard practice gloves don’t need to be ultra-high quality. But if you’re investing in a little league or competitive youth glove, you need to make sure to pay attention to how it’s constructed. Poorly designed gloves aren’t comfortable, don’t work well, and are prone to fall apart well before the season is done. 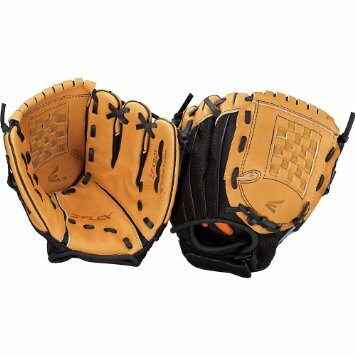 The best idea when shopping for kids baseball gloves is to look for one that is crafted out of treated leather. These pre-broken in gloves make it easy to get right out and play. In lieu of purchasing a treated leather glove, try steaming your child’s glove with a professional steamer or in a hot bathroom for 15-20 minutes before its first use. The number one easiest way to break in a youth baseball glove quickly is to purchase one that has been constructed out of high-quality treated leather. Unlike tougher traditional leather, treated leather is up to 90% worn in already, meaning a comfortable, flexible fit from the very first time it’s used out on the field. One of the most popular new trends for breaking in gloves is to use a professional glove steamer. If you’re child’s little league team doesn’t have a youth baseball glove steamer, you may want to check at local sports stores in your area – they often have them ready for use. If no glove steamer is available, a steam-filled bathroom can often be used as an alternative in 15-20 minute sessions. Glove conditioners and oils come in a myriad of different brands and compositions, but each has the same goal in mind: to loosen up the stiff leather surfaces that comprise the glove. Applying a healthy coat of conditioner before using the glove will allow it to be broken-in much more quickly than through standard use alone. Nothing is going to break in youth baseball gloves faster than actually getting out there and using it. After trying steaming or rubbing in a glove conditioner, have your child put it on and go out back for some catch. This will help stretch out the glove while it’s in its most flexible state. Best Youth Baseball Glove 2018? Here at Respectable Reviews, we believe that choosing the right glove for your child shouldn’t be a hard decision, but with so many different options out there, it often times is. Luckily, all five of the youth baseball gloves listed in this buyers’ guide could easily be considered the best youth baseball glove of 2018 dependent on your child’s size and position needs. From the budget-friendly Wilson A360 Baseball Glove to the top-rated Easton NATY1200, you can rest assured knowing that your child is getting the best glove possible, and you’re getting the best value for your money.